Some of our best craft projects are the ones in which we reuse or repurpose a junk item. That's why I have a hoard of cereal boxes, cardboard tubes, and egg cartons in my house! These are the kind of items which lend themselves to a wealth of creative ideas. 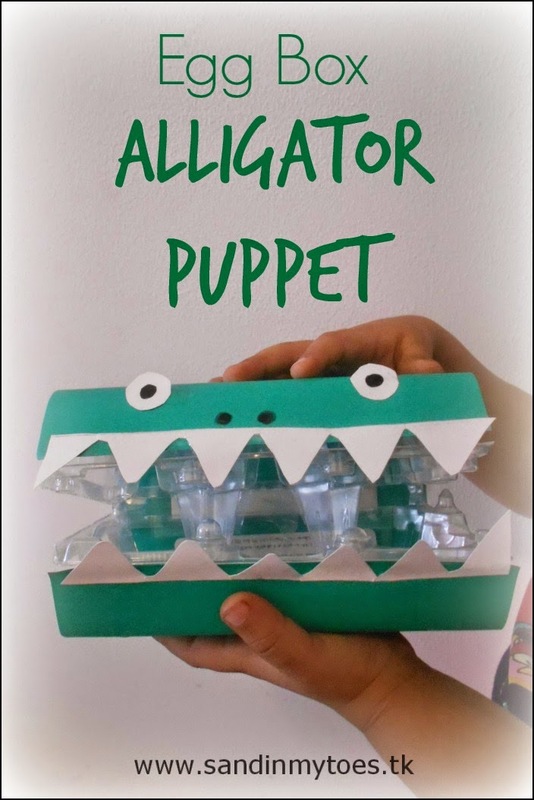 Our newest recycled craft is this Alligator Puppet that's really simple to make, but a fun toy for a child with an imagination. Plastic egg boxes are harder to work with than the carton ones, which are easier to paint or glue things on. But here in Dubai, the plastic ones are more commonly found, and one of the ways I've been using them are as disposable paint pots! 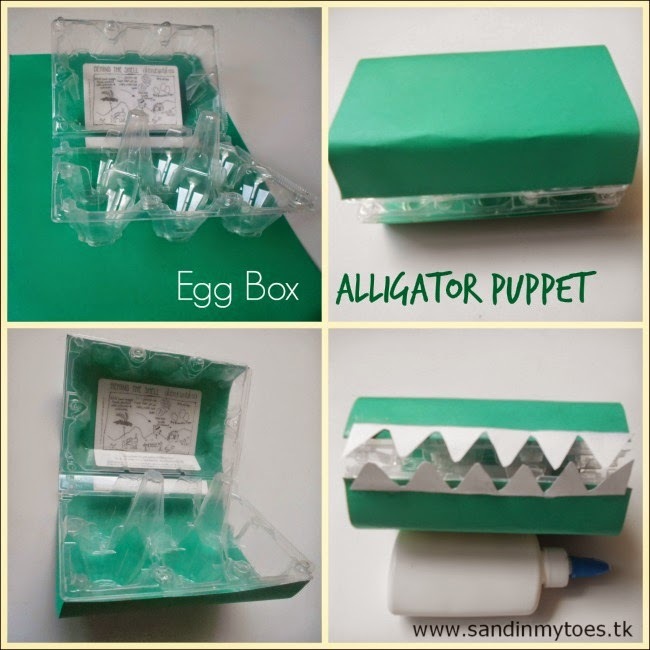 Back to our alligator craft, read on to see how we made it. 1. Measure the width of the box from the front, and cut out the green paper to cover it over the top to bottom, as shown below. Make sure you measure it while the box is closed. 2. Tape the paper in place or glue it on. I taped it mainly on the front and bottom, so the box can open and close freely. 3. Cut out the teeth with white craft paper for the top and bottom, and glue on. 4. Cut out circles for the eyes and mark the eyeballs using a black marker. You can also use large googly eyes. Also, draw nostrils with the marker. The puppet can be used by opening and closing the box by hand. You can also use this technique to make a monster or alien! This is a great idea! Our egg cartons are usually card not plastic. Love it! I've shared and pinned! Lovely simple idea and a great way to spare some imagination and play for children. Love the teeth. Great little craft! this is going straight onto my Pinterest board! Yes, problem is they're mostly plastic here! 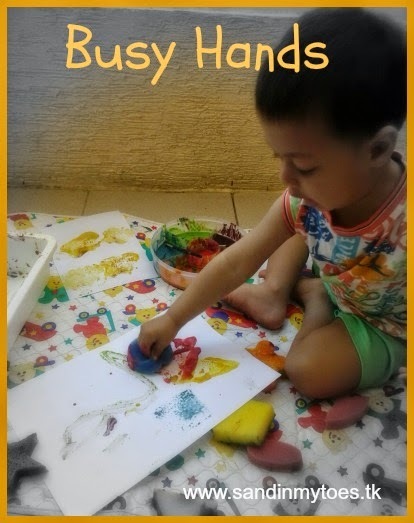 It makes for great imaginative play! Oh wow i'm going to try this with my daughter. Hope she has fun with it! Would love to see how yours turned out! 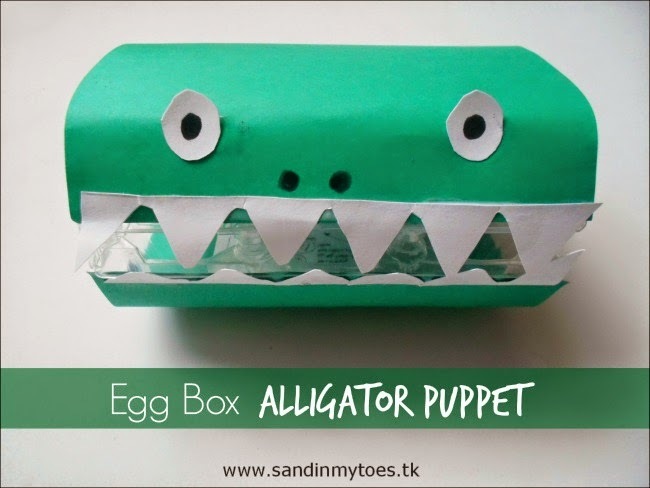 http://www.lovinglifewithlittleones.com/2015/03/making-eggbox-crocodile.html -the post is up now! So cute! We'll have to try this. Genius! We always throw away egg boxes. We have plastic and cardboard boxes available here. Now I know what to do with them! You are so good at stuff like these Tarana! So cute! I always throw out my egg boxes and think "I bet we could make something with this" and that's as far as I get.